Women had remarkably active roles in two major protests in the city of Kazeroun, southern Iran, Charmahal Bakhtiari Province, southwestern Iran. Tuesday, April 17, 2018, thousands of people of Kazeroun took to the city’s main square for the second consecutive day. The city’s bazaaris and shopowners closed their shops. Women played an active role in the protesters’ efforts to enter the Governorate’s Office led to clashes with security forces. To see images of this protest, click on the videoclip linked below. 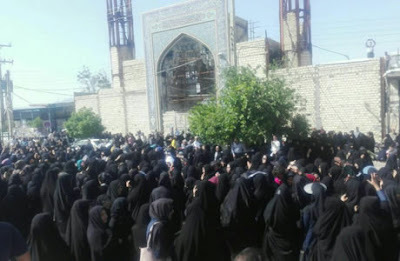 On the same day, more than 2,000 of the people of Saman, Shahr-e Kord and other cities of Charmahal Bakhtiari Province, in southwestern Iran, staged protests against diversion of the province’s water to Yazd. Protesters including a large number of women gathered in front of the Polzaman Khan Mosque in the city of Saman. Officials are planning to divert the water of Charmahal Bakhtiari Province to Yazd Province (central Iran) through Golab Channel.